In the cold, black hold of a sailing ship, a young woman lies dying. Far away, a mother agonizes over the loss of her infant daughter years before. Worlds apart, unaware of each other, mother and daughter fight their lonely battles for survival. Between them—a man rising to greatness with the new America will bring them together. The Eighth Sea—finding the meaning of our lives, our way home. Nineteen years later, Brenna, unaware of her true identity, begins an odyssey that will take her far from her dismal existence on St. Christopher. A chance encounter with a mysterious sea captain will forever change the course of her life. In the old Roman city of Bath, Nathan begins an unrelenting search for Brenna that sweeps across England, involving romance, murder and intrigue. The Eighth Sea is a passionate love story involving two unforgettable characters—Brenna and Nathan. Their story is our story. It is a universal theme—finding our place in the world, the meaning of our lives, our way home. 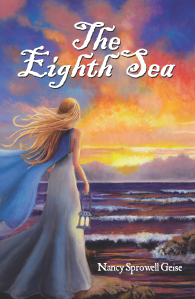 Brenna’s solution is to set sail beyond the only world she has ever known and into her eighth sea. The story is inspirational, and its romance is deep and enduring. The Eighth Sea has been described as a book that is hard to put down, its plot filled with many unexpected twists and its characters hard to get out of one’s mind…an inspiring journey into the unknown. The story’s themes: a long journey; separation and return; uncertainty; searching and finding; the search for understanding God’s will amidst tragedy; and finally, the realization that people can be bound together forever. Struggling to triumph are three major characters: Brenna—determined to find her place in the world yet haunted by the shadows of abandonment and self-doubt; Emily—plagued with grief over the loss of her only child and unable to dispel the shadows of things unresolved; and Nathan—strong and charismatic, discovering that in his search for Brenna, he has found himself. The story’s primary characters have all sailed into their own eighth sea, both within and without—true journeys into the unknown. Finding personal meaning in the steady search beyond transforms each of their lives. Their story is a tribute to the human experiences of good overcoming evil, the power of persistence, and of love enduring against all odds. The Eighth Sea is a must read for individuals and book clubs alike. This story will remain with you as a beacon as you make your way through your own Eighth Sea. Order The Eighth Sea now. I wrote a song for my novel (or rather it sort of wrote itself), and made a CD of it. I commissioned a fabulous artist, Susan Jenkins, to do the cover of my book. She created a 3 minute video of the 15 hours it took her to do the painting and then she uploaded it to a YouTube. The cover and a lantern: The artist, Susan Jenkins, and I worked closely to develop the cover. We wanted to portray Brenna holding a lantern, which signifies so much of what this story is about…searching, finding the light of life, etc. I had sent Susan photos of various old lanterns, but never felt any captured the right look. On a Friday of the weekend she was to begin putting paint to canvas, I sent her an idea for a lantern we were settling for but not thrilled about. The following Sunday, I attended services at the lovely, historic First Presbyterian Church in Topeka, Kansas. Its remarkable Tiffany & Co. stained-glass windows, installed in 1911, were reportedly designed by Mr. Tiffany himself. As we entered, my husband remarked that the lantern in one of the windows would be a wonderful model for the cover. I agreed; this particular window has always been my favorite. It shows Nicodemus holding a lantern while speaking with Jesus. The lantern’s remarkable design, with no artificial light, allows it to appear “lit” even late in the day when the other windows darken. So, with lanterns on my mind, you can imagine my surprise when Senior Pastor Bradley Walker said in his sermon that day, “Today we are going to do something a little different. We are going to turn down the lights and I want the congregation to focus on that window and that lantern!” I have commented several times that I believe God has shown his presence (and his sense of humor) throughout this writing process…and the lantern and the sermon were no exception. I immediately contacted Susan, who was just about to begin painting the lantern portion. (If you view the video link, listed on the next page, of the painting coming to life, watch to see what happens to the lantern.) I am so grateful to Mr. Tiffany for this wonderful lantern design and to artist Susan Jenkins for bringing it again to light. For more art by Susan Jenkins, visit her website. Every time I worked on my book, this little melody came into my head. It was driving me crazy, so one day – several years ago – I decided to see if I could play it on the piano. (I barely play the piano, so this was a task!) When my husband came home that night and I played it for him…he said, “That sounds like your book. You should put words to it.” A light bulb went off…so I got a poem I had written for my character Emily; I had never been able to find a place for the poem in the book. Anyway, the poem pretty much dropped into the music. So I gathered a group of musicians and we went into a recording studio and made the CD. The book is about a family journeying by ship from England to American in 1769…and there is a terrible ship wreck and they think they’ve lost their infant daughter Brenna…when in fact, she was rescued and then raised on St. Christopher. The book then skips 19 years later to Brenna’s life. The song is written from Emily’s perspective (never able to come to terms with the loss of her daughter…she always sensed something was not right), willing her thoughts through the wind and over the seas to her lost daughter. The painting is of Brenna, standing on the store, a quarter of a world away, listening. The Eighth Sea and the song are about God’s redemptive power, even in terrible times.